What does the Glynae Hyaluronic Acid Serum do? This hyaluronic acid with vitamin C serum helps you to drop decades from your face. With its super hydration properties and potent mix of antioxidants this serum helps promote the production of collagen and reduces fine lines and wrinkles to give your skin a more youthful look and feel, tightens up sagging skin and gives you a more radiant and vibrant glow. The antioxidants help to reverse the signs of aging caused by free radicals and to reduce hyper-pigmentation, uneven skin tones, dark circles under the eyes and dark spots or age spots. The result is a fresher and younger looking complexion. Who should use the Glynae Hyaluronic Acid Serum? This serum is suitable for people with oily or acne prone skin as it quickly absorbs into your skin, leaving no oily residue behind. Also suitable for people who want to rejuvenate their skin and reduce the damage caused by the aging process and by free radicals. It is safe for all skin types including dry or irritated skin, eczema or acne prone skin and dull complexions. Once you have cleansed your skin, apply sufficient serum for a light coverage of your face and neck areas. Allow to absorb into your skin fully and then apply your moisturizer or makeup as desired. It is recommended that this serum is used at least daily, preferably morning and night and results should be seen immediately. This hyaluronic acid with vitamin C serum is paraben and alcohol free and is made in a FDA approved facility in the USA. The benefits of hyaluronic acid are due to its massive ability to absorb more than 1000 times its own weight in water. This gives this serum the ability to instantly super hydrate your skin, plumping-up your skin layers and reducing fine lines and wrinkles. We normally product hyaluronic acid, but over time the amount we produce decreases substantially. This means that as we age our skin becomes drier and thicker with a tougher texture. One of the reasons that babies have such beautiful velvety skin is because of the amount of hyaluronic acid in their skin. So adding hyaluronic acid topically to our skin using a serum, allows it to deeply penetrate our skin, adding an intense boost of moisture to our skin layers. This results in a softer and suppler texture to our complexion and a more refreshed and less drawn or tired appearance. Vitamin C is essential to wound healing and cellular repair and is a super antioxidant that aids in reversing the signs of aging caused by free radical damage. Vitamin C supports our skin and reduces inflammation, dark spots and hyper-pigmentation. It also promotes the production of collagen which gives our skin a huge youthful boost and reduces the appearance of fine lines and wrinkles. Vitamin E is another potent antioxidant that helps to reverse the signs of aging in our skin, caused by free radicals and environmental pollutants. It has also long been used as an intense moisturizer in skincare products and is also essential in cellular repair. Yet another super antioxidant, vitamin D helps to rejuvenate our skin by reversing the sings of aging due to free radical damage. Our bodies normally produce enough vitamin D, however as we age our ability to produce sufficient vitamin D diminishes. The addition of this vitamin in our skincare products greatly helps to promote cell renewal and gives our skin a fresher and younger looking appearance. Vitamin A helps to rejuvenate your skin by promoting the growth of collagen and plumping-up your skin, reducing fine lines and wrinkles to give you a more youthful and even toned complexion. Vitamin A also has an exfoliant property, helping to remove dead skin cells and so preventing pores becoming clogged giving our skin a sallow or dull complexion. It also stimulates cellular renewal and all of these properties makes vitamin A effective in reducing acne and reducing the appearance of scars. PROS: Nearly 80% of all customer reviewers gave this hyaluronic acid with vitamin C serum a 4 or 5 star rating. Positive comments include that this serum makes their skin look younger with less fine lines and wrinkles, it is great for sensitive skin, does not dry the skin and people just seem to love it. CONS: Just 7.0% of reviewers gave this serum a one star rating – one person saw no difference in their skin after using this serum for 6 weeks, one found that their skin became dry and flaky and one had issues with the labeling of this serum. You can read more customer reviews here: Glynae Hyaluronic Acid Serum – Customer Reviews. Does the Glynae Hyaluronic Acid Serum work? Even though there are not many customer reviews for this serum yet on Amazon, most of them really love this serum and many are repeat customers. 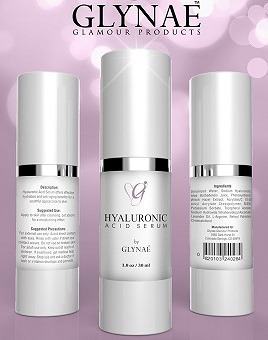 If you are wondering where to buy Glynae Hyaluronic Acid Serum – check out today’s price here. Within the US, orders over $35 receive free shipping. Read more hyaluronic acid reviews here.